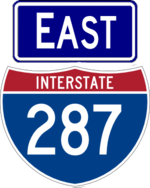 Interstate 287 is an east-west interstate in New York north of New York City. It is sometimes referred to as the divider between upstate and downstate New York. Many people consider it to be a beltway around NYC and it is concurrent with the Thruway for its entire length in New York. It includes a portion of the mainline Thruway, including the Tappan Zee Bridge, the entire Cross-Westchester Expressway, as well as an interchange with the north-south New Jersey portion of I-287. 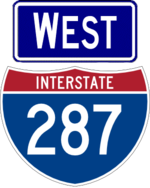 The plan was for I-287 to end at the Thruway and for the Cross-Westchester to be I-487, but the FHWA insisted on making the whole route I-287. 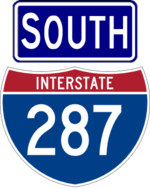 I-287 may be extended to Long Island should a bridge or tunnel over the Long Island Sound connecting to NY 135 ever be built. Albany I-287 exits at exit 15. 24.3 Spring Valley Toll Barrier Passenger cars pay no toll. New York City I-287 exits at exit 8.